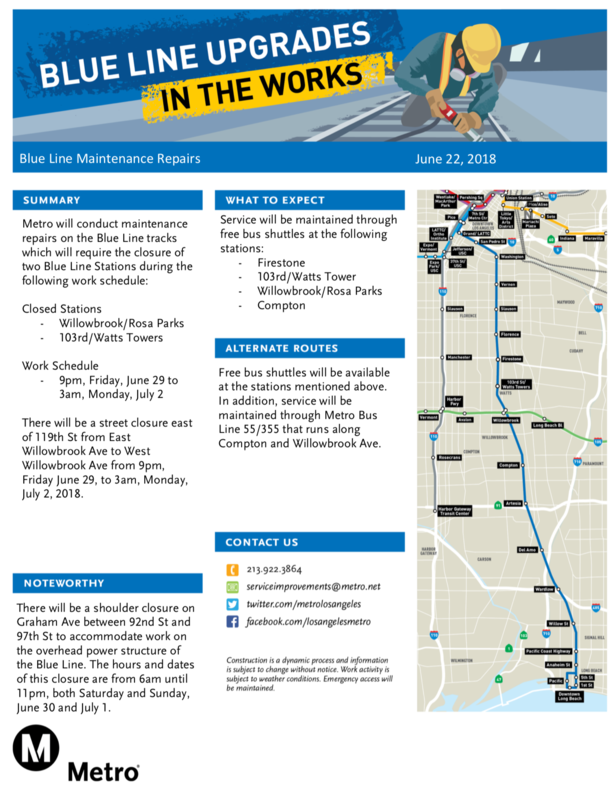 The Blue Line 103rd St/Watts Towers and Willowbrook/Rosa Parks stations will be closed this Friday, June 29 from 9 p.m. to Sunday, July 1 end of service. Bus shuttles will replace trains between Firestone and Compton stations. Metro will perform necessary track work on the Blue Line during the closures. While work is in progress, all southbound trains will travel as far as Firestone Station and turn back toward 7th Street/Metro Center. The last stop for all northbound trains will be Compton Station. From there, trains will return to downtown Long Beach. On Friday the last complete northbound trips to downtown L.A. will depart Long Beach at approximately: 7:16, 7:28, 7:42, 7:59, 8:17 p.m. The last complete southbound trips to Long Beach will depart 7th/Metro at approximately: 7:34, 7:46, 7:58, 8:10, 8:24 p.m. All times are subject to work related delays. Trains are slated to run every 12 minutes, and after 9 p.m. trains will run every 20 minutes. Buses will match Blue Line service levels as best as possible. Thank you for your patience as we work to improve the Blue Line. Be sure to allow extra travel time for your transfer between buses and trains. Regular service will resume on Monday, July 2. For the latest service updates please follow us on Twitter @metrolaalerts or call 323.GOMETRO. While a lot of work will be completed during the closure next year, there is still a lot of prep work and other necessary maintenance that must be done in the meantime. The last stop for northbound trains should be Compton? If Willowbrook/Rosa Parks and 103rd are closed, then 103rd can’t be the last station for northbound trains. Good catch! It’s been fixed. I saw a beautiful new gateless mast signal at Willowbrook on the spur track between the Blue and Green Lines. Why not replace the rest of the signals there too? I’m a big fan of Harmon Fading LEDs btw.